“Tell us a yarn…” Henrietta Baird asks of Ngioka Bunda-Heath as they reel up lengths of duct-tape to reveal the cartographic symbol their movement has mapped across the floor. Over the course of the performance the two dancers have flooded the stage with powdered, coloured dyes that billow from their white cotton dresses. As they haul in the tape, they speak casually, coyly, about fishing trips and misunderstandings. The content of their dialogue is charmingly trivial, but as the act of conversing intersects with that of uncovering the negative space beneath the dust, a notion of greater significance is communicated. In Divercity, choreographer Mariaa Randall addresses the role of individuality as it exists within and through culture. Though Bunda-Heath and Baird share heritage and identity as Indigenous Australians, each comes from a distinct cultural group and country. Baird has ties to the Kuku-Yalinji, while Bunda-Heath is a descendant of the Wakka Wakka, Biripi and Ngugi people. Consequently their dialogue in Divercity, as it plays out through movement, video projection and speech, involves difference and similarity, mapping points of divergence and transcendence as they exist in and between cultures and individuals. 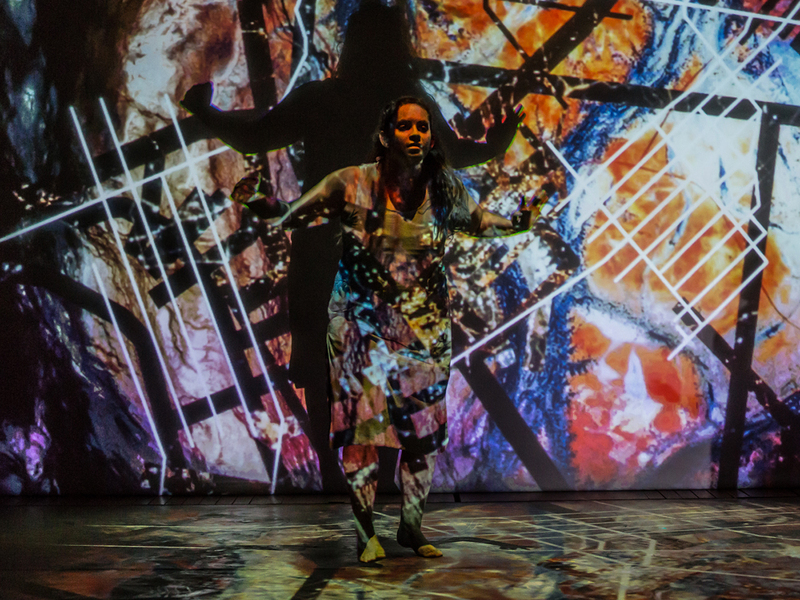 This idea of mapping is represented literally late in the piece as increasingly distinguishable birds-eye-view representations of cities and intersecting roads are projected onto the dancers and the backdrop. As the dancers perform high-intensity phrases of abrupt isolation of limbs, the projections characterise them as part of a complex network of junctures and deviations: their bodies sites which multiple stories extend across and bisect. For all their symbolic resonance however, these projections flatten the movement, much of which takes place in the back third of the stage. The subsequent distancing between audience and dance seems unnecessarily contrary to the piece’s conversational tone and the encompassing seating arrangement that borders the stage on three sides. This is in part a symptom of a wider problem: the movement lacks focus and clarity. This is apparent as the dancers kneel on the floor, repeating a series of words and phrases, some in English and others in Indigenous dialects. It is the first time the two have engaged each other verbally, and as they dismiss turns of phrase or imagined acquaintances with terms like “big noter,” the audience laugh in acknowledgement of a sardonic sensibility that is understood regardless of the specifics of language or culture. 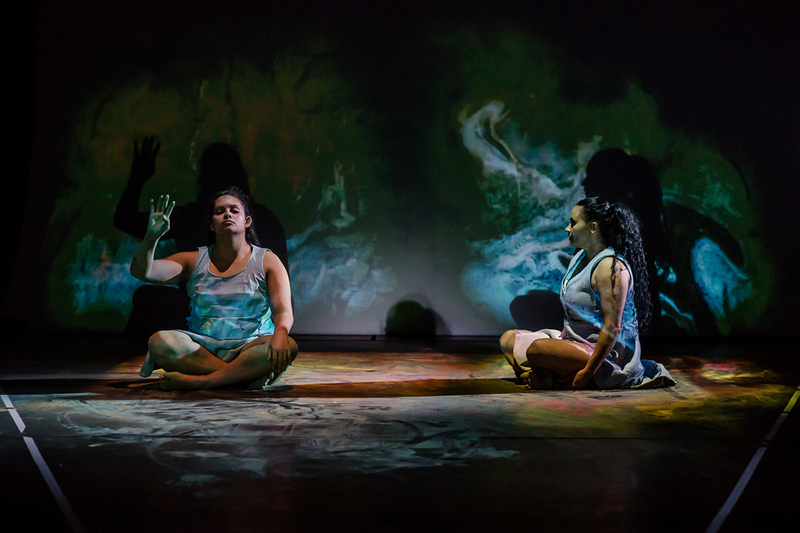 Yet the meaning behind the accompanying movement is less legible, as the dancers perform a series of indistinct sliding motions and grounded extensions that seem to function principally as a means of distributing the powdered dye across the floor. That the movement in an otherwise witty sequence operates primarily as a set-up undermines the piece’s incisive exploration of communication and translation, and gestures towards a sense of the unfinished in a manner that seems accidental rather than a fundamental aspect of the work’s thematic interrogation. Divercity is more successful when it plays directly and intentionally to the informal and the organic. In a participatory preface, female-identifying attendees are asked to enter the space prior to male audience members, and are let in on a secret. They partake in a learning process that is to be kept to themselves until later when they are called upon to join the conversation. This initiation into the work fosters a quality that is uncommon to many contemporary dance works that keep audiences at a slight remove and privilege bodies before personalities. In eschewing refinement in favour of a sense of genuine interaction between artists and audience, this introduction represents what feels by performance’s end to be the clearest distillation of the dynamics of diversity and unity that Randall is seeking to explore. As the work draws to a close with Bunda-Heath and Baird removing the lengths of duct-tape, the union of the work’s clumsy physicality and charming wit is particularly striking. There is no graceful or brief way to undertake the task, and consequently the dancers’ conversation meanders from the scripted to a seemingly authentic state of flippancy. When the dancers are able to communicate in this individualistic way, the work is offhandedly perceptive and disarming. Here it is apparent that while Mariaa Randall as an emerging director and choreographer may not yet have realised a movement vocabulary with which to coherently communicate her ideas, her understanding of when and how to allow the personalities of her dancers to carry a concept suggests a potential yet be fully articulated.